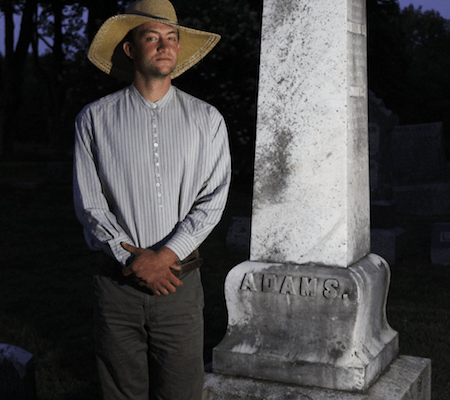 On the evening of August 9, 2014, as the full moon rose, WHS vice president Pat Kennedy led about 30 onlookers around Worthington’s Center Cemetery on Sam Hill Road. As the group would shortly discover, several residents of the cemetery had taken a break from eternity to tell their stories to the living. The evening begins at Center Cemetery. Lincoln Fishman as Jonathan Huntington. Welcome everyone to my cemetery. Well it must be mine, I was one of the earliest people buried here. My name is Jonathan Huntington, and I was the first minister of Worthington. Don’t ask what Church, that goes without saying. There was only one Church. I accepted a call in 1771 to minister to the early settlers of this beautiful wilderness because, well, I had a wee bit of trouble with the Congregational Church hierarchy back in Connecticut. Plus here they were willing to pay me 40 pounds a year to start. Even as a child, I loved to think about theological questions. My father’s friend, the Reverend Ebenezer Devotion, came to visit often and we discussed many new ideas that turned out to be disturbing to the elders of the Congregational Church. 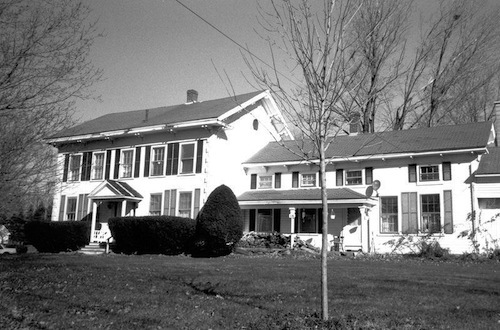 Our home in Connecticut was light-hearted and fun-loving and famous for its parties. My mother was bright and creative and known for her intelligence and sense of humor. People say I took after her! Of course I liked to have a little fun, but my reputation for revelry and drinking was overrated. My dear wife, Sarah Huntington, brought me stability and direction. She encouraged me to apprentice so I could learn medicine, which she thought was more suitable to my temperament, so I did that for awhile. However, I couldn’t resist arguing about theology – it was such an exciting time and we were talking about such revolutionary ideas! For example, I believed that no matter how sinful a person had been, he could still enter the Kingdom of Heaven if he were truly sorry – even without the blessing of the Church! My free thinking, love of music and jokes, and my occasional fondness for libation meant it was hard for me to find a congregation in stuffy Connecticut. Plus I wanted to experience some adventure. So I ended up in the “wilds of Worthington,” preaching to this growing community of about 650 folks. Of course, not all of my parishoners agreed with my way of thinking, especially that Nathan Leonard and his kin from down along the Kinne Brook, who got themselves elected selectmen. Deacon Leonard thought I was too permissive and didn’t hesitate to say so. As well as preaching, I had a farm and built a grand house where I saw patients. And the children kept coming! But we weren’t wealthy; our fortunes depended on the fortunes of the town, and sometimes the farmers can spare neither corn nor labor. I’ll admit, I sometimes got away from the domestic side of my life by partaking in spirits and lively conversation at the tavern of my good friend, Timothy Meech, over on the Post Road. My brother Samuel, who championed the colonists’ cause, kept us informed of the troubles brewing with England. I believed in our cause and to prove it, I invested my money in the new Continental currency. Overall, life has been good in Worthington. My most fervent wish was that the good Lord grant me a long, peaceful life here, free of debt and worry, as I watch my liberal ideas blossom and my children and their children grow up in optimism and prosperity. 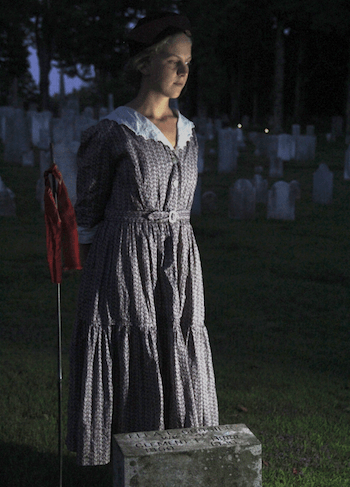 Judy Babcock as Sarah Huntington. My name is Sarah Huntington. I was born in Lebanon, Connecticut, in 1738. My father, Simon Huntington, was a poor farmer who died when I was fifteen. My mother, left with seven children, remarried. You may be wondering why my married name is also Huntington. I married my cousin! This happens often in the colonies. There aren’t a lot of people to choose from, and most marriages are arranged anyway. It’s one way of knowing something reliable about the person you marry. As it turned out, I grew to love my husband, Jonathan. We married in 1757 and our first child, Sarah, was born nine months later. She died within the month. But we were blessed by the arrival of Lucy in 1759. I knew Jonathan wanted to do something other than farming, so I encouraged him to study medicine. But I soon realized that Jonathan’s true inspiration came from those new and revolutionary ideas that were threatening the cohesion of our Congregational Church! We were not wealthy and the babies kept coming, so I was relieved when Jonathan finally became a doctor. As a doctor his rebellious, fun-loving wit might be acceptable. But his heart was never in it and he just had to become part of the Church controversy, so he entered the ministry as well. I had hoped my husband would be appointed to a wealthy, prestigious church in Connecticut. Instead, he accepted the offer of a new church here in Worthington. We arrived here in 1771, not long after the town was incorporated. I insisted on at least having a nice home, so Jonathan acquired a beautiful house, which he had moved to West Street. You can still see my lovely home if you look up the road to the corner. The church was built across the street. What a poor thing that church was – not much better than a barn! And it was never finished! Birds flew in and out and roosted in the balcony! But Jonathan believed that the physical structure of the church was not so important, as long as the spirit flourished. Although the town promised to pay him at least 40 pounds a year in coin and produce, he was never paid regularly. I did manage to keep him respectably clothed in a black wool suit, which I made out of wool I had spun and dyed myself. He even had silver buckles on his shoes! The children were well-dressed too, and as they got older they helped farm; eventually some married and settled nearby. 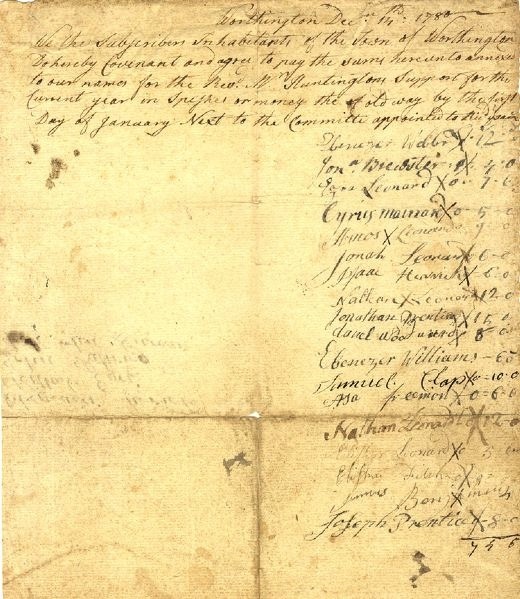 Promise of payment to Jonathan Huntington from Worthington residents, 1780. Meanwhile, Jonathan continued to involve himself in Church and governmental controversies. He spent a bit too much time at the tavern of Timothy Meech, where revolutionary ideas were being discussed. As he mentioned, we ended up getting into fights with the Leonard family, who were pretty powerful in both the Church and the town (which really were the same thing in those days). They just couldn’t appreciate Jonathan’s friendly and relaxed style, but my dear husband was so well loved that his congregation remained loyal to him. Then we lost our money! My husband had invested in Continental currency, which became worthless. And the people of Worthington couldn’t pay Jonathan with cash or goods. My dear husband, harried by the Leonards, was heavily in debt, preaching in that awful, drafty building, and worrying about how to feed his family. He caught sick and died, imagine! He was only forty-eight. My children and I were penniless and our creditors and the Leonards were our ruination. After our debts were paid I was left owning a one-third share of my house as my “Dower Rights.” My son Simon inherited another third, and my brother-in-law Samuel bought the last third so that I did not have to share my home with strangers. But I was only allowed to use the back stairs, and only at certain times of the day. I was given a portion of the barn so that I might keep a cow. And my boys were given one suit apiece from my husband’s belongings. Those Leonards took control of the church and had it moved over east to Harvey Road. They also hired a new minister, that boring and pompous Jonathan Pomeroy. My heart broke when they moved the graveyard to a place halfway between the new church and the old one on Sam Hill Road. My baby Sybil’s stone was lost! But as my children grew up and married – and some married very well, like my namesake Sarah, who married Elisha Brewster – my life improved. I didn’t remarry and died ten years after my husband. But here we are in this lovely spot, facing the setting sun every day, in the beautiful town of Worthington. Rose Cherneff as Ella Crosier Burr. Oh! There you all are, I was waiting for you to get over here. Just standing here counting gravestones to pass the time. There are a lot more now than I remember from the last time I was here. I am Ella Crosier Burr, though I was a Burr for many more years than I was a Crosier. I was married to my Clement for nearly 60 years at the time of my unexpected passing. He was from an old Worthington family, as you can see from all the Burr gravestones around here. I was an outsider, from Chesterfield. We had five sons, and two of them, Frank and Joe, lived here in Worthington, too. They were all born in our farmhouse on Kinne Brook Road. It’s still owned by a Burr and standing proud for all to see. The boys were a bit wild. I remember the day they were brought a gift of a doll, and when I next looked out the window they were shooting arrows at it. We sent them to be educated at the Conwell Academy down in South Worthington. My Clement courted me for several years before I agreed to marry. He kept on pestering his “Nell” with letters and asking me to write back, even when he was sent away to see if he liked life in Illinois, which he didn’t. Then he came back just to be with me, and since I really liked him anyway, I gave in. His father had just died and someone was needed to take over the Burr family farm. That was back in 1870. Parsonage of the Women’s Benevolent Society. I was also Secretary-Treasurer of the Church’s Women’s Benevolent Society for decades. I was one of the original members in 1888, and one of the original incorporators in 1894. Mrs. Chauncey Pease loaned the WBS the money to build a parsonage, and I was especially proud, in 1920, to deliver our final payment to her. We were grateful that she only charged interest every other year! And I am proud to say that my son Frank’s wife, Harriett, eventually took over from me as treasurer of the WBS. But really I am not here to tell you about myself. I want to tell you a sad story not too many people know about. There used to be a lot of small factories in Worthington making things mostly from wood: sleds, tools, drums for banjos, pen holders, you name it. Pen holders – you know – the handles for metal pen nibs! Many of these factories hired young men in the summer to help out. During the summer of 1912, three German boys arrived to work at Bradley’s pen factory in South Worthington. On September 12 they all went for a swim in Russell H. Conwell’s Little Galilee Pond – you can still see it off Ireland Street. Hermann Sachtleben, poor lad, drowned. He was only 18! He was buried two days later in Ringville Cemetery. The boys who were with him came to the funeral. They spoke little English but Mr. Willard, the preacher, said a prayer in German and at least they understood that. 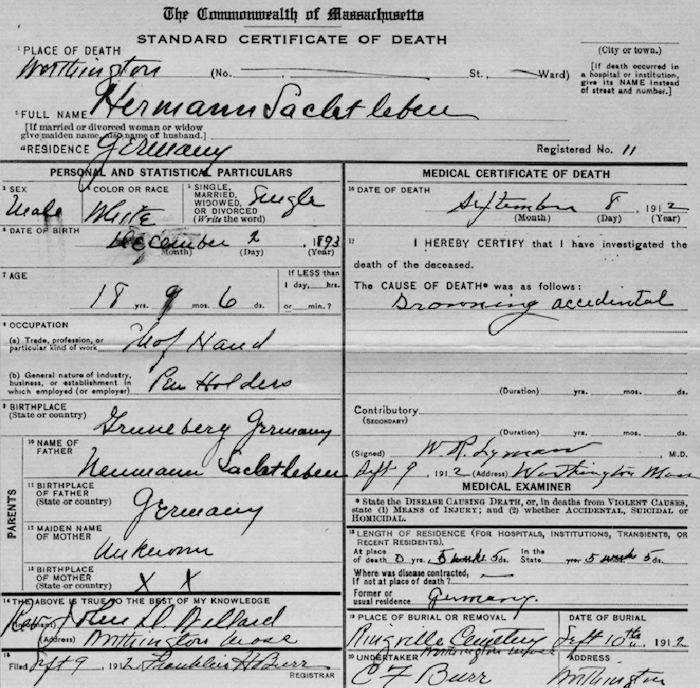 Death certificate for Hermann Sachtleben. Now I’ve had five children, and can only imagine what a grief it would be to lose a grown son, especially one so far away. So I wrote to Hermann’s mother, Bertha, telling her of his death and including a photograph of his grave. 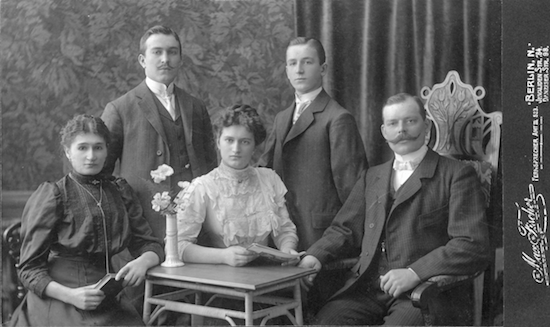 And she wrote back – two letters in fact – with a photograph of her family, including Hermann. Letter from Bertha Sachtleben to Ella Crosier Burr. We are honored dear Mrs. Burr, and deeply grateful that you have told us that you yourself had a share in preparing our dear child for his last rest. We know now that he sleeps quietly and softly, and this is a great comfort for us. For my mother-heart would not otherwise be quiet. May dear God richly repay you, Mrs. Burr, your great love and goodness which you have done to our child and so to us…And I venture to…make another request. On the second of December is the birthday of our Hermann, when he would have been 19 years old. We would be very pleased if on this day we might know that there was a wreath on his grave. Would you, my dear Mrs. Burr, be willing to undertake this? Now I will finally tell you why my letter has been so delayed. Our uncle in America, Klocke is his name, lives in Mayville and he wanted to talk with you about erecting a tombstone for our son. We have waited a very long time for news from our uncle about this visit, and it seems a letter must have gone missing; otherwise we cannot understand what happened…Please do not think…we wished to refrain from attending to the care of the tombstone – we were waiting until our uncle appeared in Worthington with you. Should he be further delayed, then I ask you, dear Mrs. Burr, to once again decorate the tombstone of our beloved son on the anniversary of his death, the 8th of September. We are regretful to hear that you, dear, honored Mrs. Burr, have suffered so in your eyes. We hope wholeheartedly that you are once again in good health. Uncle Klocke never showed up and this was the last letter I received from Hermann’s mother. Sadly, Hermann’s grave in Ringville Cemetery remains unmarked, his memory in Worthington mine to keep and share now with you. Ach! My heart breaks for those people. 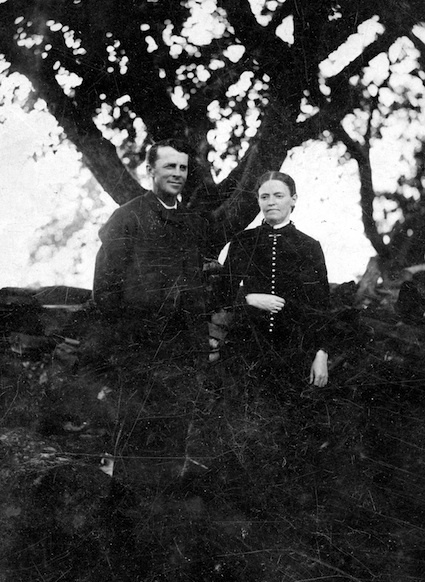 Clement and Ella Crosier Burr, c. 1880s. My health started to get worse and by the late 1920s I couldn’t do most of the things I once could. I was often bedridden, besieged by headaches and painful joints. I lost a lot of weight. I didn’t go to church or go out to visit. I couldn’t go upstairs or wash dishes or do any housework for nearly a year. While I was ailing, my husband, Clement, along with some of the boys, did the cooking, laundry, cleaning and washing up, and the repairs as well as all the farm chores. I could talk with folks on the telephone we had put in – other folks from nearby houses could listen in on the party line, but that didn’t matter. I also went out on automobile drives from time to time, and got to watch Lindbergh’s mother fly over our house in an aeroplane. 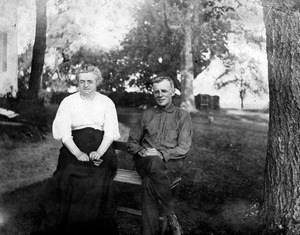 Clement and Ella Crosier Burr c. 1930. We also had one of those new radios, and while I couldn’t move much out of the house unless someone helped me, the whole world opened before me. Who’d have ever thought I could listen to the speeches of both Herbert Hoover and Al Smith after each was nominated for president, or that I would get to hear the election results as they were happening? (By the way, Clement voted for Mr. Hoover, but Smith won handily in Worthington.) Then there were Douglas Fairbanks and John Barrymore speaking right to me, and Gene Tunney’s knockout fight, sounding like it was happening right in our living room. We read a lot too, although those electric lights were a bit too bright for our taste. Each Thanksgiving, Clement and I would think and talk about the things we were grateful for. We never lacked. Just sitting there with him, after all those years together, always seemed enough. I am glad we can continue to be together here. Greetings folks! I was born back in 1846 in my house up the road, built by my great-grandfather, Sam Follett, in 1783. He was a Revolutionary War hero who fought at the Battle of Bunker Hill and voted for George Washington. In his time there were half a dozen houses up there, and the church, parsonage, and burial ground were just down the hill near West Street. It was pretty much the center of town at that time. Follett is my middle name, and I am sure proud of it! When my great-grandfather died, the property was left to his granddaughter, Elizabeth Follett Hills, my mother. She had married Julius Hills some time before and had two sons. My mother wasn’t allowed to own the property because she was a woman, but she could keep it in trust for me and my brother Daniel until we came of age. My house isn’t there anymore, but parts of it can be found in other houses all over Worthington. 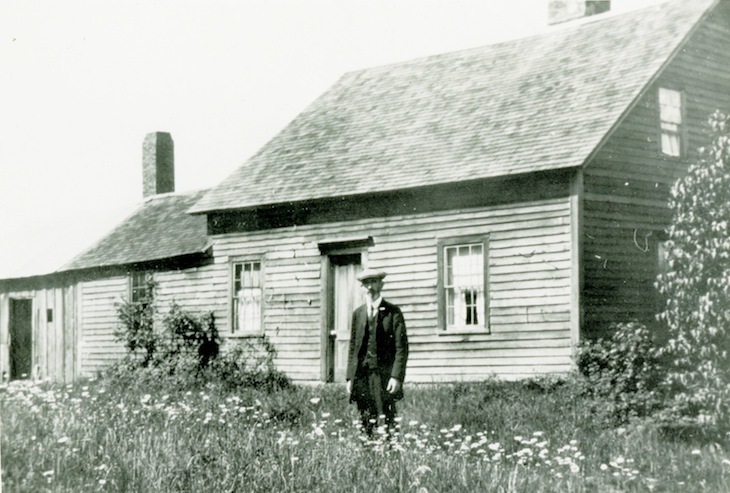 Sam Hills in front of his house c. 1925. The farm contained 100 acres, much of it cleared, and we raised cows and sheep. We also had a large orchard. The road ran from West Street past my house and continued west over to the middle branch of the Westfield River. The part that ran through Horace Bartlett’s property had gates across the road at the start and end of his pasture to keep his cattle from wandering too much. Every time I came or went I had get down from my wagon and open and close them. What a pain! Well, I went to town meeting and tried to get those fool selectmen to help me change this, but to no avail. I finally had to sue the town. They knew they were in trouble because I was already famous for taking my law books to town meeting. One day in court the judge asked me if the gates were “pretty fair gates, as gates run?” I replied that I “never saw a gate run,” so I couldn’t really say. The case cost the town several hundred dollars, which was a lot of money in those days. It took a couple of years, but it was finally settled in my favor when Deacon Bartlett agreed to fence the fields and remove the gates. This solution cost $15 and that was that. Eventually they named the road for me, but of course they got my name spelled wrong. It’s “Hills” with an s, Sam Hills! Any fool would have known that. But I guess Sam Hills Hill Road would have sounded strange. I was just a boy when the Town Hall was built in 1855. It was built on land donated by Mr. William Coit. He stipulated that a four-and-a-half-foot fence be built around the building – folks were big on gates and fences in those days. Anyway, Mr. Coit lived up on the Old Post Road, near the Bartlett place, which became the Bartlett Hotel and then the Worthington Inn. He made such a fuss when they built the new Town Hall, making them move it just south of the church so he could have an unobstructed view of the church from his home. There were a lot fewer trees in those days. That was the church that burned in 1887. Jesse Rothman as Sam Hills. Speaking of the old days, another thing you young folks might not remember is what we called a “turkey shoot”. They were held near the basket shop at the Corners. The hen was placed on top of a barrel and weighted so it couldn’t get away. The fee was 10 cents a shot, at a distance of 8 or 9 rods (40 or 50 yards for those of you who don’t know anything). I brought my great-grandfather’s flintlock gun. They laughed at my old-fashioned gun, but I didn’t let that bother me. I succeeded in shooting several hens. When Mr. William Ward tried out my gun he got his hen all right, but the gun kicked him over and his wig flew off! We got a good laugh out of that. I was around long enough and was enough of a bother that I eventually was elected as a selectman myself, a couple of times if I recall correctly. Loved to debate any chance I got, and especially loved showing off those law books at the annual town meeting. In 1871 I married Josephine Mayhew, who had grown up on the next farm over, and we had a son and two daughters. We had a good life here in Worthington without hardly ever having to leave town. And I lived to be eighty-four! Sam DeBosky as John Adams. Good evening, kind folks. My name is John Adams. I was born right here in Worthington on May 4, 1804. 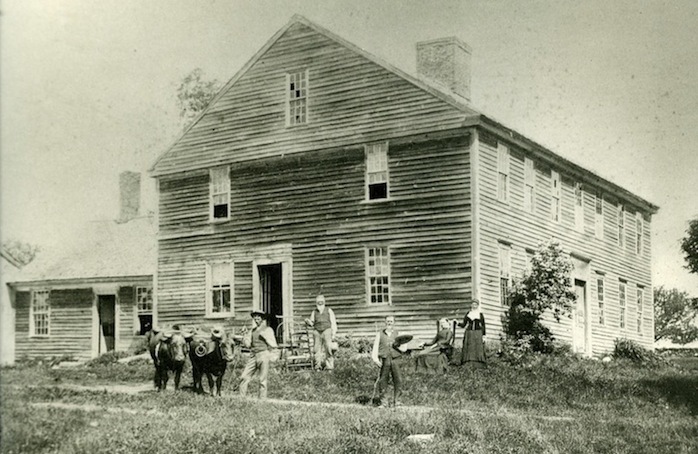 Although my father was from Connecticut, my mother, Elizabeth Watts, descended from one of Worthington’s earliest settlers. After my father became president of the Union Bank in Boston, we moved there and that’s where I spent my childhood. I married Mary Ann Bryant of Chesterfield on New Year’s Day in 1838. I was 34 and she was 24, and we came back to live in Worthington. I set up as a hardware merchant, as well as a farmer. My first house was near the town’s first schoolhouse, about a mile south from what was called Worthington Center. Just before I married, I bought a 146-acre farm off of Luther Higgins for $5,300. It stretched on both sides of what is now Huntington Road. 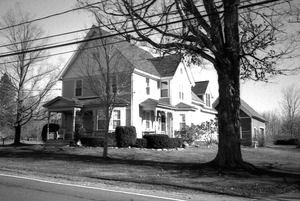 That house was too small and mean for a growing and prosperous family like ours was going to be, so I had it torn down and by 1843 had replaced it with a modern house in the Gothic style with a two-story entry porch, board and batten siding, and those beautiful bay windows. The kitchen and carriage houses were conveniently in separate wings on the back. People whispered that it was just too modern and not like the other houses around here, but I didn’t care. I thought it was handsome and so did Mary Ann. You can still see it up there on what they now call Radiker Road, though it has suffered some over time. I was voted selectman from 1842 to 1844, which shows not only my commitment to the town, but that I commanded respect and was viewed as a man of influence. In 1852 I joined with my neighbor Elisha Brewster to start the Agricultural Society. We got 150 members just like that. Three years later, we changed our name to the Green Mountain Agricultural Society to include other towns. For a decade or so we held big cattle, sheep and horse shows every year on the Town Commons surrounding the church. That was a highlight of the summer’s activities. Eventually we became The Grange. By then I was a prominent member of the Church, and in 1856 I was elected representative to the general Court of Massachusetts. An honor, of course, but it meant I had to undertake the difficult trip to Boston more than I wanted to. My wife and I farmed and were lucky enough to have five children, three boys and two girls. You may not know this, but from the time the town was first settled, the town government and the Church government were intertwined, like peas in a pod. 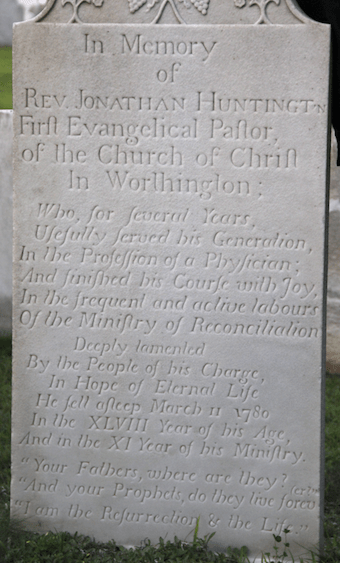 The community was officially called the Parish of Worthington. Each year when we got a tax bill, half would go to maintaining the town – the roads and schools and the like – and half went to the Church. The idea of separation between church and state was not appealing to many of the citizenry of this fair community. 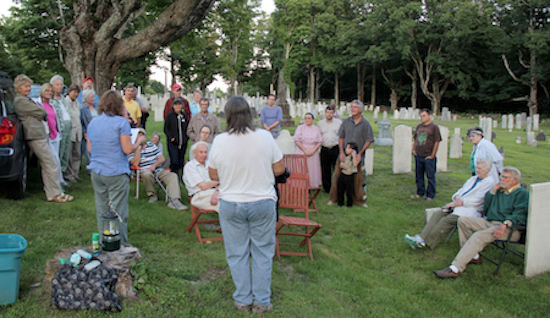 At the annual town meetings, parish as well as secular business was the order of the day. The elected town officials managed the day-to-day operations of both town and Church, although the Church retained the exclusive right to discipline its members. By 1862 I was back to being selectman, and two of us (I won’t name names) felt that the town and Church should be independent of each other. We spoke up about it until the state, in 1865, ordered the town to call a meeting and separate town and Church – separate money, separate management. Needless to say, some of the powers-that-be were not so happy about this and it might be said they knew how to hold a grudge. These particular years may not have special meaning for you folks any more, but the nation had splintered following Lincoln’s election in 1860 and was then at war. The War of the Rebellion was what we called it. The President called for 75,000 volunteers, and in 1861 the Worthington selectmen voted to pay $50 for each volunteer, and to pay families left needy by the departure of a loved one up to $2,000 to help them get through. We didn’t think the war was going to last much longer than three months. My son was one of the first volunteers, though he did not sign up in Worthington. William enlisted in the New York 61st Regiment in October 1861, but he never made it into battle. He died in an Army hospital in Alexandria, Virginia, on December 26, 1861. For him the war did only last three months! Volunteers weren’t very easy to find in Worthington, even after we upped the bounty to $125. In 1862 my other son and namesake, John, enlisted with the 86th Illinois Regiment, Company H, and was made quartermaster. He died in Nashville, Tennessee, in February of 1863, of a fever. Imagine how my poor wife felt when she learned that her boys lay dying in distant field hospitals, and she unable to get to them. In John’s regiment more men died of disease than were killed outright in battle. This was, unfortunately, pretty typical. The call for a volunteer army didn’t work out and in 1863, President Lincoln instituted a draft. Many of Worthington’s young men went to serve, but not a few found themselves paying the nice sum of $3,000 for someone else to go in their stead. This was perfectly legal and pretty common at that time. Although I remained an active selectman, in my personal life I despaired and became a recluse, refusing to leave the house to attend church or to pay my Church taxes. It was compulsory in those days to attend church, and the Church retained the authority to strictly discipline anyone who failed to abide by its requirements. To be named someone “who walks disorderly” could spell financial and personal ruin. I was visited by a committee of my former friends and “warned” to mend my ways. Ha! I didn’t want to have any further concert with those hypocrites who couldn’t understand my grief! I went so far as to apply for permission to join the Methodist Church in South Worthington, though I never went through with it. In the end I was suspended from the Church by a vote of 18 to 1. Discipline triumphed over compassion. I eventually returned to the Church. In 1868 I wrote a nice letter to Deacon Lafayette Stevens, agreeing to let bygones be bygones and pursue the path of peace. Peace had come to our reunited country three years earlier. Our sons were two of over 700,000 boys on both sides to give their lives in that terrible conflict. Imagine how I felt in 1866, when I was part of a committee asked to study a proposal to “see if the Town [would] raise money to refund to individuals the money paid by them for substitutes.” The men who could afford to pay another man to take his place in the draft – and quite likely take his place in a shallow grave – wanted to be reimbursed! We voted no! I lived ten years longer than my two boys, which just isn’t natural or expected. And I never really got over the loss of them. A farmer needs many sons to build a future for. Well, thank you for your time. It looks like there’s a lady over there beckoning, so you best hurry along. Lila Cherneff as Bessie Ames. Over here! 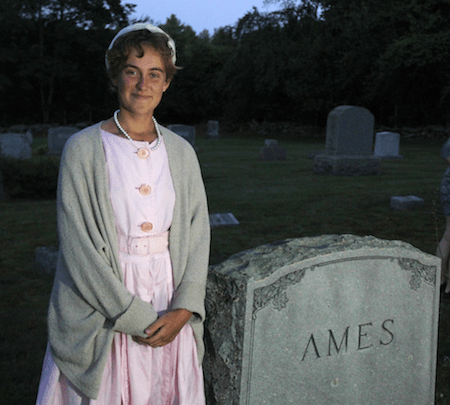 I am Bessie Anne Fletcher Ames, born in Marshfield, Massachusetts, on March 26, 1856. Let’s see, that makes me 158 years old! I don’t look at day over 95, do I? And I lived through three great wars and a few lesser ones! I’ve always been Bessie Ames, never Mrs. anybody, so you can call me Miss Ames, if you please. My father, Luther, was a shoemaker, and my mother, Mary Spinney, kept house. We were five children. 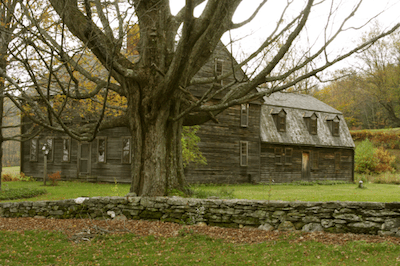 By 1880 my family had moved to Cheshire, New Hampshire, so my father could farm. At that time I was 23 and a certified bona fide nurse – one of the first graduates of the Boston Training School for Nurses, established by the Massachusetts General Hospital in 1873. I spent the winters nursing in Springfield and the summers farming in New Hampshire. By 1883 I had saved enough money to buy my own house. Worthington seemed like a fitting town for a young woman making her own way in life, and I was able to buy a house on Harvey Road that was originally built by Sidney Brewster. I paid the grand sum of $1,500. I was surrounded by Brewsters in those early days. I joined the Congregational Church in 1888, the same year the new church building was completed, and became one of the earliest members of the Women’s Benevolent Society – just like my friend Ella Burr over there. But then – oh, it was horrible! – the house burned to the ground. Luckily, with a little help from my friends and some hard-working neighbors, I was able to rebuild a very large, commodious Colonial Revival house. You can still see it. Very tasteful and well-built, don’t you think? It meant I could take in boarders, and by 1900 my aging father, his second wife, four boarders, and a lovely young Swedish servant named Frederika were all living with me. I continued to do winter work as a nurse at my office at 68 Court Street in Springfield. The house was too cold for winter boarders. I had quite a lot of land, and rented it out to the neighbor farmers. Besides overseeing all my tenants and rebuilding the house, I became active in the Women’s Benevolent Society and served as president for six years, starting in 1912. Those were exciting years, when all sorts of new ideas were getting discussed – especially about what women could or could not do! Springfield Daily Republican, August 14, 1913. I can still see the audience at the WBS meeting in Lyceum Hall that day in August 1913 when, as president, I introduced Miss Amy Wren. She had come from Brooklyn, New York, to talk about the legal status of women (which wasn’t very good, I can tell you). The front of the stage was covered with masses of green foliage and yellow flowers, and large yellow “Votes for Women” banners were draped all around. Miss Wren was a commanding speaker and the audience was rapt. She told of how women had been considered property throughout most of our history, and how things were changing – mostly due to women’s own efforts, but thanks in part to those brave men who were willing to put themselves on the line. The applause was so loud – too bad there were so few men there to see and hear her. I finally did get to vote seven years later, in 1920. I was lucky that I was already thirty, which was the legal age for women. There was a presidential election that year, and I chose between Warren Harding (whose running mate was our neighbor from Northampton, Calvin Coolidge) and his opponent, James Cox (whose running mate was the handsome and youthful Franklin Delano Roosevelt). By the way, men could vote when they were 21. I won’t tell you who I voted for because my vote was secret. But I did vote! By this time I was getting older, and spending time as a nurse every winter was getting harder. So I decided to turn my home, which I had named Hilltop Farm, into a summer guest house. My nephew John Ames had been living with me since after the Great War, and he helped out. He complained when I asked him to sleep in the barn during the summer, but really, there wasn’t enough room and I needed every penny I could get. During this time Worthington became what you folks now like to call a “destination.” There was the grand Worthington Inn run by the Trows at the Corners, that lovely new golf course, a casino, and many other attractions. Several of my neighbors took in summer guests as well. 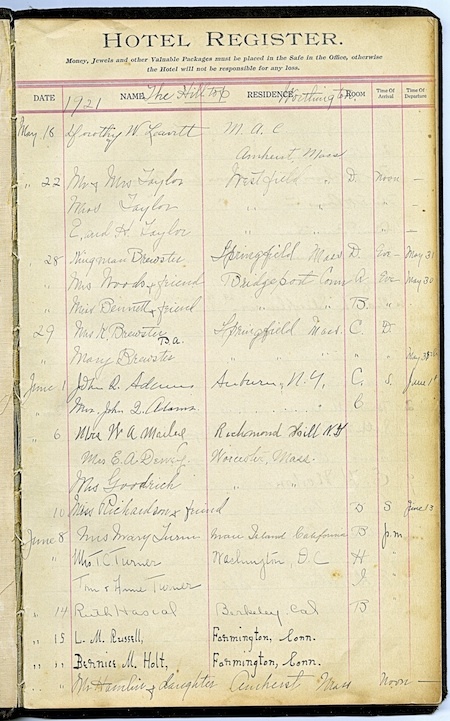 Hotel Register for Hilltop Farm. My house was special. I could serve lunch and dinner in the dining room, and many folks from around town came here just to eat. I charged $10 a week for the rooms and most of my guests were lovely people, up from the cities – Springfield, New York, Boston – women who came with their children for a week or for the whole summer while their husbands visited on the weekends. Some came from as far away as California and England. Of course there were always a few complainers, especially the man who told me I should get running water piped in from the new water system that was built in 1911. I had a perfectly good well. I told him the hand pump in the kitchen was good enough for him if it was good enough for me, but he made it clear that if I wanted to keep my customers, I needed to get more modern. I wasn’t against being “modern” – it was the cost! Everything was so expensive and running a guest house isn’t cheap, I can tell you that. I did put in the running water, and made a private bathroom, but I put a box on the top of the tub so that anyone who wanted to use the water could pay me 10 cents a bath. Water doesn’t grow on trees, you know. But I admit, it was nice to be able to take a hot bath once in awhile. While I have your attention I want to let you know that there is absolutely no truth to the rumor that on weekends I rented rooms to working girls who came from Springfield. Of course since I’d been a nurse down there I knew quite a few girls of all kinds. And even if I did rent out the occasional room, whatever they did in there with their gentlemen friends was their business. I ran a respectable guest house and many of my customers returned year after year. By the 1930s, though, things were not so good with the economy. The Lafayette Lodge (the name the new owners gave to the old Worthington Inn) burned. People found it hard to find the money for long summer vacations, or even for the gas to come up to the hills. The air and food might be good up here, but not worth spending the rent money for. Also my nephew John had fallen for one of those tubercular girls who were recovering in that sanitarium across the street (I think someone named Gerrie Kennedy lives there now). He wanted to marry her! So he built her a house across the street from me, with lots of windows and no screens anywhere, so it could be full of fresh air and breezes. He moved in with her, but then a few months later she died! What was he thinking? He eventually married another woman, Hildy, and we got along just fine. She was a churchgoing woman and into good works, and eventually she and John helped me as I had helped John when he was younger. I lived through another awful war and didn’t die until I was 95, but those last ten years are a bit of a blur – I was told I could be quite a hoot! I guess I always was. So that’s some of my story. Glad you could come visit us all today. If you stick around for a bit we’ll be glad to share a toast to the living and the dead! Pat Kennedy teaches English at Holyoke Community College and is the commissioner for Center Cemetery. She came by her interest in cemetery care and preservation by way of genealogical research. Most of the information about burials in Worthington was not online, so she decided to start producing burial lists with the help of Diane Brenner and Ed Lewis of the Worthington Historical Society. The Worthington Cemetery Commission has undertaken the task of repairing and cleaning stones in our cemeteries and has made significant progress over the last few years, thanks to the generosity of the Rolland Cemetery Fund. Diane Brenner has lived in Worthington since 1994 and has been a longtime member of the Worthington Historical Society, serving on its board and as one of its archivists. As someone who loves the mystery and adventure of historical research, she has curated several exhibits and contributed articles and photographs to The Corners. 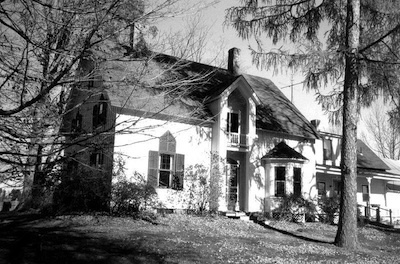 The original owners of the 19th-century home she shares with her spouse, Jan Roby, are buried in nearby Center Cemetery. Her other main focus is public health, and she serves on the Worthington Board of Health and as president of the board of the Hilltown Community Health Center. 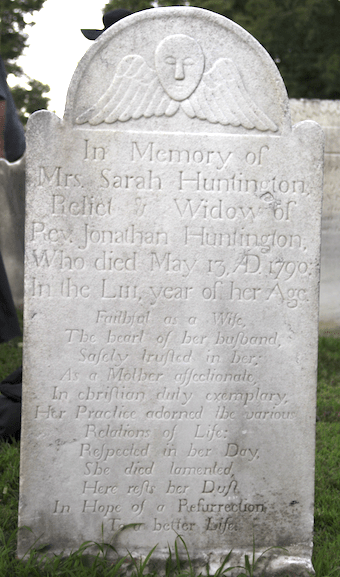 As mentioned above, some of the text for Jonathan and Sarah Huntington was taken directly from Jerilee Cain’s 2007 paper, “Sarah Huntington: 1738/1790.” Information on Sam Hills and John Adams came from various papers in the book Papers on the History of Worthington. Additional information on Sam Hills, John Adams, and Bessie Ames came from the book Forty Worthington Houses, by Daniel R. Porter III. For Bessie Ames, Pat Kennedy interviewed Ted and Shirley Porter, and Diane Brenner found newspaper articles documenting the women’s suffrage meeting in 1913 and Ames’s involvement with the Women’s Benevolent Society. Newspaper obituaries were found for Sam Hills, Ella Crosier, and Bessie Ames. We’re very fortunate to be able to consult the work of other researchers who’ve contributed to telling the story of Worthington, including Elizabeth Payne, Carl and Ida Joslyn, Lois Brown, Kathy Baker, and Beverly Smith. The material on Ella Crosier Burr came mostly from the Burr Family Archives, including the Sachtleben letters and Clement Burr’s diaries from 1868-1869 and 1929. 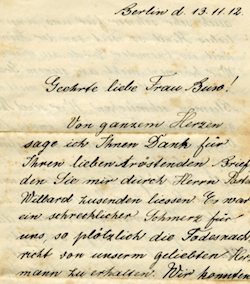 The second Sachtleben letter was translated from the German by Shannon Godlove. The idea for a series of WHS walks was proposed by Rose Cherneff of Worthington’s Sawyer Farm. 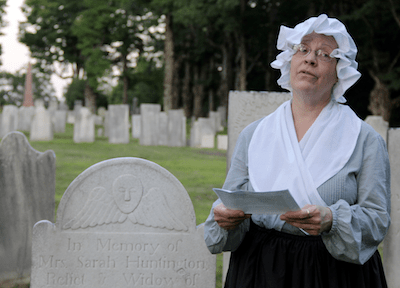 It was also Rose’s idea to invite some deceased Worthington residents to visit with us. 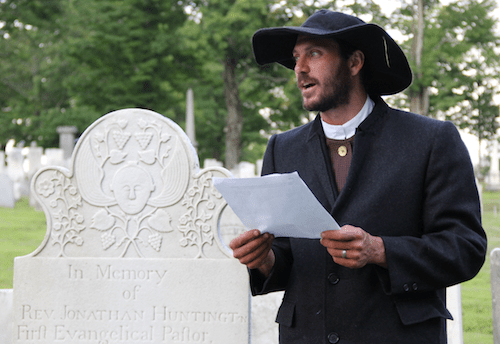 The dead Worthingtonians were played by Lincoln Fishman (Jonathan Huntington), Judy Babcock (Sarah Huntington), Rose Cherneff (Ella Crosier Burr), Jesse Rothman (Sam Hills), Sam DeBosky (John Adams), and Lila Cherneff (Bessie Ames). Their photographs were taken by Evan Spring. This entry was posted in Uncategorized on August 8, 2015 by whs. Good morning – I hope you can answer a simple question: how did Sam Hill Road gets its name? Was it for a person named Sam Hill, or for a hill named after someone called Sam? I drove the road back in March, just as winter was easing up. The road ran straight as an arrow – can I assume it was following a property line? Thank you for your help! Hi Mark, Sorry for the delay in getting back to you. The road led to the residence of Sam Hill (or Hills, he used both), you can read a little about him in the blog from the Center Cemetery walk. He lived near the top of the hill (now the dirt part of the road). Many roads in town have “Hill” incorporated into them (e.g. Thayer Hill Road, Thatcher Hill Road), all named after early residents of the town. In the case of Sam Hill Road thew name was truncated because, as his ghost says, “Sam Hills’s Hill Road” would have been awkward. I am sure there are many Sam Hill’s for whom the phrase “What in the. . .” but for what it is worth, our Sam Hill was described as quite the curmudgeon. Hope this helps. Sunday, May 5, departing 1:00pm from the Capen-Riverside Schoolhouse, intersection of Rte. 112 (Dingle Rd.) and Clark Hill Rd. Ben Brown leads a backwoods hike in the vicinity of a historical militia training ground near the Worthington-Cummington border. Please note: This ramble begins with a stream crossing that may be difficult, and requires hiking through some dense, steep, or mucky stretches of forest. The total distance is around four miles or more, and the ramble will take around three hours or more. Please bring insect repellent, snacks, and plenty of water. Participants should please sign up in advance by emailing Evan Spring at evanspring@gmail.com.